A very difficult links type course requiring a variety of throws. Open, long beautiful vistas, wooded shots, lots of water hazards and OB. 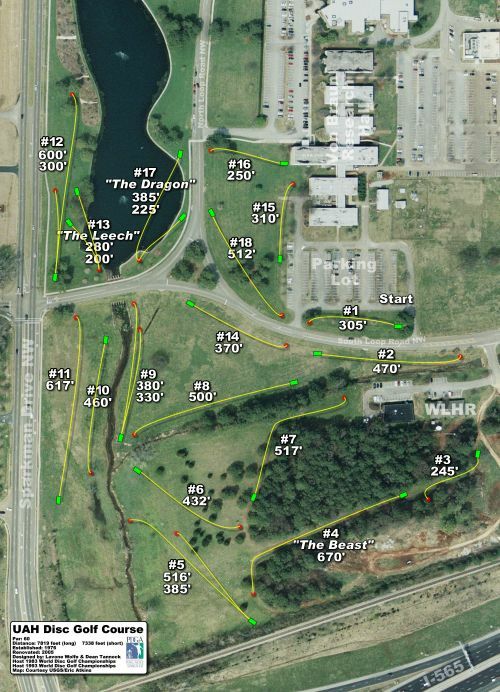 Long, but those with accurate middle distance can play this course well. Lots of risk/reward will penalize long shots that lack control. I-565 to Sparkman Drive, go north 0.25 mile to a right on Technology Dr. which runs into John Wright Dr. Turn left into 1st parking lot on left. Have you played at Univ. of Ala. Huntsville (UAH)? Be the first person to review this course!